Wednesday February 12 1908 Will went to town this forenoon to be shaved. I baked the cake to take to the church tonight. I made a little tatting. We got ready to go down at 5.37 going directly to the church. It was simply splendid. The tables for 400 looked beautiful. The supper fine. We ate at Carrie Anderson's table with a lot of the relatives The toasts were entertaining. We got home at 11.20 well [pleased?] 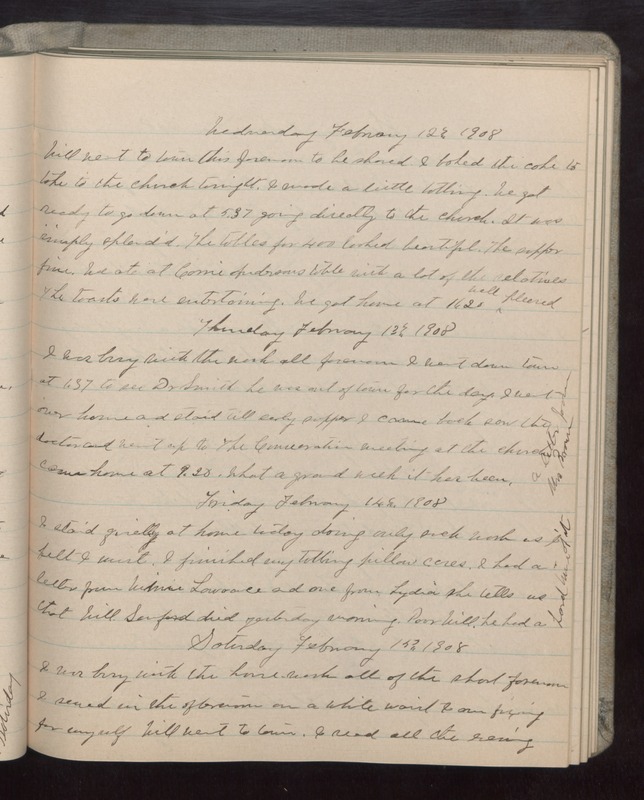 Thursday February 13 1908 I was busy with the work all forenoon I went down town at 1.37 to see Dr Smith he was out of town for the day. I went over home and staid till early supper I cam back saw the doctor and went up to the [Commemoration?] meeting at the church came home at 9.20. What a grand week it has been. A letter from Mrs Brown Friday February 14 1908 I staid quietly at home today doing only such work as I felt I must. I finished my tatting pillow cases. I had a letter from Winnie Lawrence and one from Lydia she tells us that Will Sanford died yesterday morning. Poor Will. he had a hard time of it. Saturday February 15 1908 I was busy with the house-work all of the short forenoon I sewed in the afternoon on a white waist I am fixing for myself. Will went to to town. I read all the evening.